Bluebills, eager to serve and to find needs they can fill, were the guests on honor at an appreciation luncheon June 16 at the Teachers Resource Center. The host was World Vision which took the occasion of the resource centers seventh anniversary to thank the Bluebills and Boeing. The guests were admonished to stay seated and be waited on by the WV servers. World Vision warehouse manager Jim Peterson was host for the barbecue. He passed out volumes of verbal thanks and plaques to the 100 volunteers and Boeing representatives for their efforts in behalf of the 58,000 needy students who benefited this school year. "Bluebills usually bring their own food, but today, you are our guests," Peterson said. "Thanks to Bluebills and Boeing support, our collaboration has made a difference in lots of young lives," he said. "None of this could have been done without you." World Visions Jenny Printz highlighted the success of the program, which has grown from 20 schools and 6,000 students in 1999 to 160 schools and 58,000 students this past school year. The phenomenal growth has been achieved because the Bluebills efforts  which this season accumulated 8,000 volunteer hours. Guests were treated to a special report from Laurie DeWhitt, ESL teacher at Campbell Hill and Bryn Mawr . There are 140 students enrolled in her ESL (English as a second language) classes, representing 14 languages. She described how the teachers use the supplies to motivate the students and provide incentives. "The kids are amazed at the materials we bring them from the warehouse," she said. "Having the resource center has made the job much easier and our teaching more effective." Peterson reported that contributions continue to be down, due to Katrina and other natural disasters. "So we have to work harder. The challenge is still there," he said. "The program continues to evolve, and we are looking forward to the fall opening of another warehouse in the Seattle metro area to better serve city teachers." World Visions staffers planned the event and served up the barbecue, which also featured decorations, favors and cheesecake desserts. 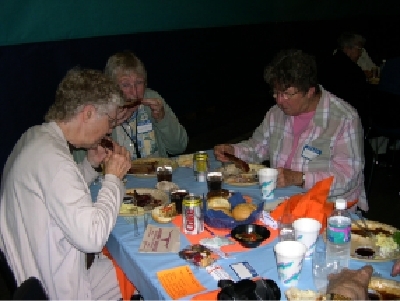 (Above) Eating ribs, left to right, Donna Crueger, Maybelle Brickley, Janice Hawes.